Area names and boundaries have changed over the years. In the forties Beach Haven was considered to be only that area from Hilders Corner to the Beach Haven Wharf. 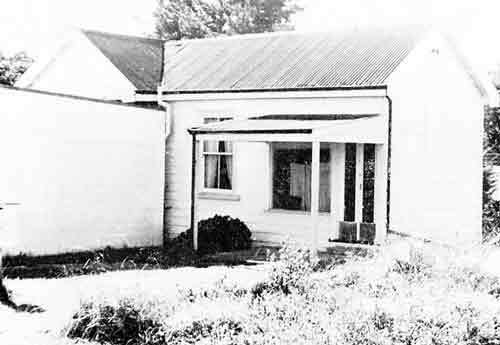 In those days what is now part of Rangatira Road up to Aeroview Drive was called Kiwi Road, and from Hilders Corner to Kahika Road was then part of Puriri Road. Both these stretches of road were known as Birkdale. Beach Haven was the less desirable address to have. Very few people had private phones and public phones were scarce - one at Verrans Corner (penny in the slot) and (maybe) one at Blennerhassets Store near the Beach Haven Wharf. The Birkdale Post Office was in Hilders Store - then the only building on Hilders Corner until the Methodist Church was built in the late thirties - built over two Saturdays with voluntary labour. The Post Office Phone was a party line with Greenhithe and Paremoremo the other parties. The Birkdale ring was the morse code "A" - short-long. Greenhithe was "S" - three short rings and Paremoremo (almost always called 'Parry') was "O" - three long rings, often three very long rings as it was at times hard to get an answer. With private phones so rare people had to come to the Birkdale Post Office for toll calls. I still remember one family who used to regularly call at night - taking advantage of cheap rates - their relatives in Te Teko - 6J was the number I recall. Telegrams were sent from and delivered in the Beach Haven-Birkdale area as far as what is now the junction of Verbena Road and Eskdale Road and beyond Verrans Corner to the reservoir, and down Vermont Rd - now Verbena Road - also a short stretch of about 300 yards down Verran Road, then called Victoria Road East. Vermont/Verbena Rd did not join Eskdale then. Waipa Road from the reservoir was serviced from the Birkenhead Post Office that used to be at the bottom of Hinemoa Street near the top of the Birkenhead Wharf Hill. Birkdale telegrams were delivered firstly by my father, Wenman (Bill) Hilder on foot, then by my elder brothers Stan, Colin and Ivan by bicycle after school and finally by me until I left school in 1946. Delivery was either free or sixpence (memory fades) for the first mile from the Post Office to about Hadfield Street on Rangatira Road and Eskdale Road on Birkdale Road. For the next mile, which covered the distance to the Birkenhead Transport garage, a charge of one shilling was made and (mostly) paid willingly enough by the recipient. Beyond two miles, which was all Verbena and as much of Verrans Road as then existed, plus a short sector at the bottom of Island Bay Road, the delivery fee was two shillings. Loud were the complaints from some addressees, but when delivery was refused they soon paid. It was worth two shillings to ride a bike up from Hilders Corner to anywhere down Verbena and then back up the Verbena Hill again, particularly on a wet windy evening. Remember the roads were almost all metalled, sometimes graded, and occasionally rolled. There was a short piece of tarseal on Taylors Hill between Eskdale and Tiri Tiri Roads: and another between Verrans Corner and Island Bay Road. There must have been a Councillor living on these bits of road. During the war many telegrams were from the Defence Department advising relatives of servicemen injured, missing or killed, though I can not recall me ever having to deliver any such death reports - perhaps Dad (Bill Hilder) delivered these. Telegrams were the only means that people had of receiving official news of their serving families. Shortly after the end of the war the shop was sold and with increasing numbers of private phones, telegrams began to be rung through instead of being hand delivered.